Each minute you invest in publicity shows direct results in VBS registration. Good publicity increases preregistrations and lets you make more accurate decisions about supplies, space, snacks, and volunteers. Remember, first impressions are lasting ones. Still, marketing experts now-a-days say people need to hear or see information at least thirteen times before they respond. This becomes even more important when you consider the busy lives of families. Get the word out and the kids into your VBS with these ideas. Personal Invitations. In this day of texts and instant messages, a personal invitation can go a long way. Send VBS invitations to member children and past attendees. Send out invitations when the summer program information is released in your community, six to eight weeks before VBS, or certainly before school ends. Develop and maintain lists for future mailings. Banners Attract. Spread the word about Barnyard Roundup with our large Outdoor Banner. Personalize it with your program information. Use our adhesive letters and numbers. Use the Decorating Posters, included in your Starter Kit. Mount the Theme Poster on cardboard, and place it in your entry beside a registration table. Use the Registration Table Banner from another of the posters to draw attention to your table. Hang the Publicity Posters, also included in your Starter Kit, at church, libraries, and other places with plenty of foot traffic. Social media. People are already connecting—make sure VBS is part of the conversation! Host a Farm-tastic Preview. Offer an evening or daytime “barnyard” experience where members can gather ’round, enjoy a campfire, eat Bountiful Blessing Snacks, and get a preview of songs and games from Barnyard Roundup. Parade it. Make a float to advertise VBS in a summer parade. Use ideas from the “Decorate!” section or in the site descriptions. Enlist children to ride on the float and toss wrapped candies to the crowd. Have teens and adults walk alongside to hand out informational flyers. Carnival with Petting Zoo. Set up a neighborhood carnival or block party with farm animals to pet and games for children. 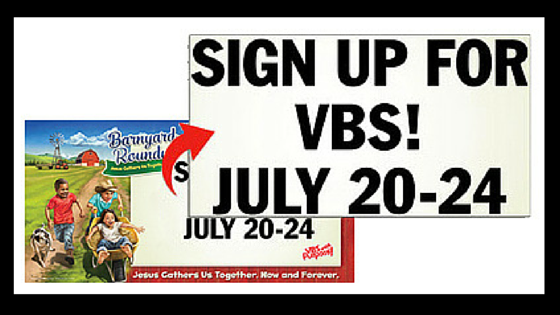 Recruit volunteers to staff a VBS information table with flyers and registration forms. Invite a mall-full of children. Take Polly the Pig Puppet, other decorations, registration forms, and pens to a mall, shopping center, grocery store, or library. Set up a registration table, and sign kids up on the spot.